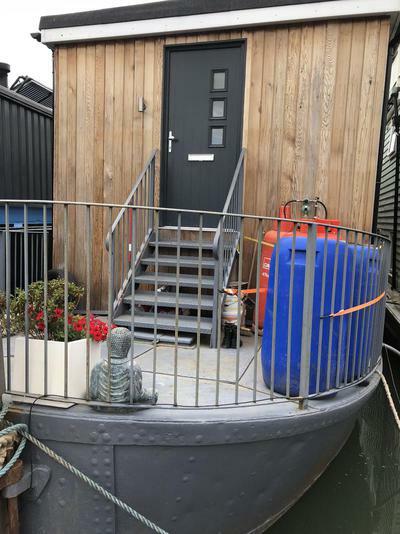 Premier Houseboats are pleased to present the River Lee 2, a stunning and contemporary houseboat, fitted out to an extremely high level both internally and externally, offering amazing light and airy living space, and excellent external space. Great thought was put into the creation of this modern houseboat, with every effort made to ensure an incredible standard of luxury throughout. Entering through a large front door you are immediately struck by the amazing light and space River Lee 2 offers, and the high quality of finish is noticeable from the outset. The kitchen diner has been fitted with a large gas range, and has a built in fridge freezer and dish washer. The modern units are all soft closing and the work surfaces are of high quality. there is a small utility room that houses the washing machine and gas boiler. A large skylight in the middle of this living area compliments the light offered from the many fully double glazed windows. The lounge area is again spacious, light and well finished, including laminate flooring and gas fired under floor heating throughout the upper accommodation. LED lighting is fitted throughout the boat. Outside there is a small deck area, which in the summer months can become an extension of the living area by utilising the bi folding doors. Steps lead up to the upper terrace, a large external area which has been astro turfed and had railings placed around. This area offers fantastic views and offers great space to entertain, of just enjoy your surroundings. From the kitchen a stairway leads down to the lower level accommodation. this is fully carpeted throughout, fully gas central heated and again has many double glazed windows. The first bedroom off the corridor is a good sized double, with a modern en suite housing shower cubicle, toilet and hand basin. The next bedroom along is a good sized single, or small double. Both these rooms have excellent storage built in. The master suite is an amazing space, a large and spacious double bedroom with built in storage and room for more. The en suite to this room is incredible, and finished to an extremely high standard. It has a stand alone bath, large shower cubicle, toilet and his and hers hand basins. River Lee 2 offers amazing space, both internally and externally. The finish is luxurious, and as a family home it offers incredible value for money. Surveyed in 2016, and fitted externally with low maintenance cedar cladding, River Lee 2 must be seen to be truly appreciated. Vessel name: River Lee 2 Vessel condition: Excellent Year constructed: 1965 Year refitted: 2017 Berths: 6 Cabins: 3 Heads: 2 Length over all: 78' Beam: 14' Maximum draft: 3' Hull material: Steel Hull type: Flat Hull colour: grey Disclaimer Premier Houseboats offers the details of this advert in good faith as it was presented by the seller or his representative but cannot guarantee or warrant the accuracy of this information nor warrant the condition of the described item within this advert. A buyer should instruct his agents, or his surveyors, to investigate such details as the buyer desires validated. The Item described within this advert is offered subject to prior sale, price change, or withdrawal without notice.